OAK RIDGE, TN - The Oak Ridge Civic Music Association has announced its 74th concert season — Distinctly Oak Ridge — with concerts beginning in August and culminating in April, 2019. Audience members will experience jazz, klezmer, Americana, film, Broadway, folk and classical music, highlighted by the trumpet, oboe, cello, organ, violin, and voice. The season opens on Sunday, August 26, 2018, 3:00 PM, with the Free Family Concert, "What's Up at the Symphony," featuring music from Looney Tunes and the dazzling sister-and-brother violin duo of Lydia and Garren Anderson, winners of the 2018 Youth Aliyah Concert sponsored by Oak Ridge Hadassah. "The Free Family Concert is a wonderful opportunity for families and children to experience the world of a symphony orchestra," says Music Director Dan Allcott. We'll play fun music that will make you laugh out loud, and you will be star struck by the youth talent featured on stage and in the lobby. An instrument petting zoo caps off the joy of music making." Back by popular demand, the Tesla String Quartet and Thomas Gallant collaborate in music for strings and oboe to open the Oak Ridge Chamber Music Series on Sunday, September 23, 2018, 3:00 PM at Pollard Auditorium. "There is no shortage of exceptional chamber musicians eager to perform in Oak Ridge," says Bill Schwenterly, Chamber Music Series Chairperson. "Our audience will also hear performances by the Cumberland Piano Trio, the Kosower & Oh Cello & Piano Duo, and Big Galut(e) Klezmer Ensemble." The Oak Ridge Symphony Orchestra & Chorus subscription series opens on Saturday, September 29, 2018, 7:30 PM, in a concert featuring a wide variety of music representing America. Chorus Director Jaclyn Johnson will lead the ensemble in music by Randall Thompson set to poetry by Robert Frost. "The entire concert is one that audience members of all ages can connect to," Johnson said. ORCMA is a proud participant in the Penny4Arts programming that enables all Youth 18 and under to attend any ORCMA concert for free during the 2018–2019 season. Additionally, each concert will have an element of interest to youth. "Maestro Allcott has curated a season that meets our mission on many levels, and the residency presented by Mark Kosower, Principal Cellist of The Cleveland Orchestra provides a wonderful offering for the community at large, and in particular for students," said Executive Director Lisa Muci Eckhoff. 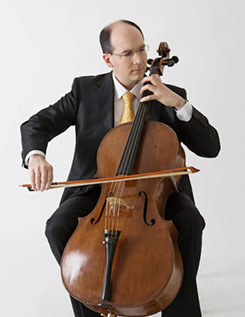 Kosower will lead a Free Masterclass for ORSO cellists and their students, area music teachers and their students, and anyone interested in learning more about music through the classical cello repertoire. Kosower will be joined by his wife Jee-Won Oh on the Chamber Music Series, and will close his residency with a performance of two cello concertos with the Oak Ridge Symphony Orchestra. All concerts are free for youth 18 and under, and adults attending the masterclass will receive discounted pricing for the residency concerts. The Oak Ridge Chorus will be featured in two chorus-only concerts — "Music for Royalty" showcasing the organ at First United Methodist Church of Oak Ridge, and "Bach to Broadway" which will offer concert-goers an opportunity to mix and mingle while enjoying light hors d'oeuvres and bidding on silent auction items to support ORCMA's mission to serve the Oak Ridge community with quality music, music education and music performance opportunities. In March, the ORSO & Chorus join forces for the Tennessee premier of Symphony: This Will Be Our Reply, composed by Lucas Richman after Leonard Bernstein's speech, "An Artist's Response to Violence." Beethoven's magnificent Symphony #3 Eroica is also on the program. Rounding out the subscription series, the Oak Ridge Symphony strings will perform a rousing finale entitled Chamber Delights & Dances with Concertmaster Karen Kartal and Principal Oboist Ayca Yayman in the spotlight. Susan Shor, Chairperson of the Free Coffee Concert Series anticipates another year of outstanding performances by locally based musicians. "Visit the ORCMA website, sign up for the ORCMA eNewsletter, and watch for flyers around town advertising these fabulous programs." The Oak Ridge Civic Music Association receives generous support from the Tennessee Arts Commission, University of Tennessee-Battelle and the Oak Ridge National Lab, and WUOT FM 91.9. Information is available at www.ORCMA.org. Subscriptions may be purchased by calling or emailing the office, (865) 483-5569 or office@orcma.org. Individual tickets may be purchased online, via telephone, or at the door.